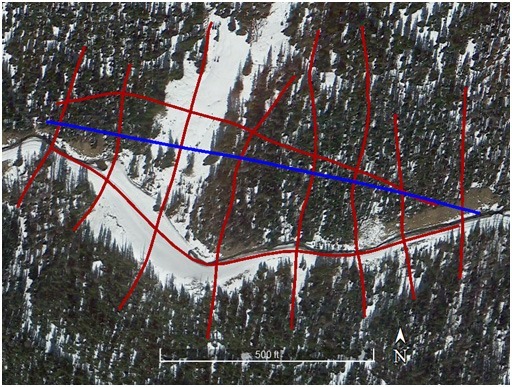 Purpose: Provide engineering geophysics information to support the realignment of a water drainage feature in Colorado. Objective: Map the top of the bedrock. 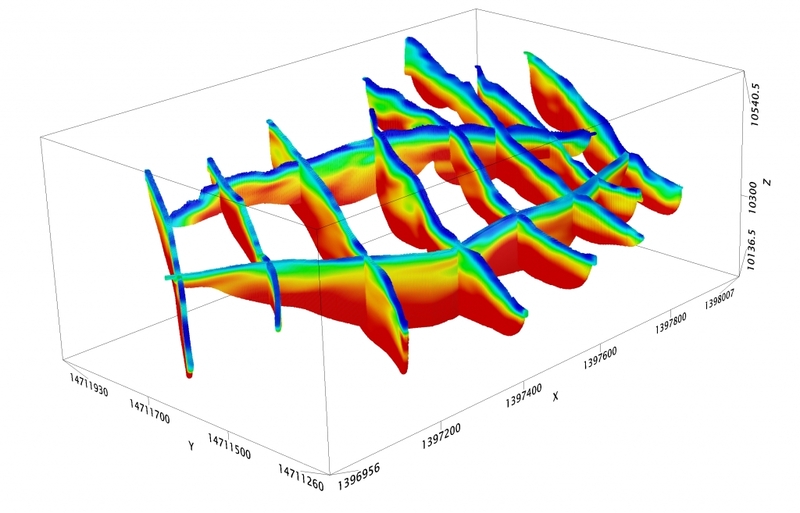 Method: Seismic Refraction Tomography (SRT) was used for this project. A total of 10 SRT lines were collected, totaling about 6700 linear feet. 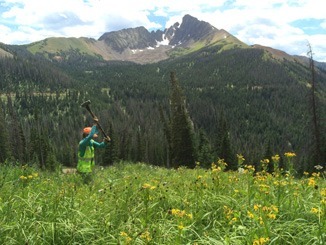 Data Acquisition: A three-man seismic crew with 10-pound hammer source performed the refraction survey in mountainous, forested terrain that varied from flat to steep over the course of seven days. Interpretation: The two major processing steps involved with SRT are first arrival picking and data inversion. The first arrival picking step consists of picking the time for each trace (signal) where the first arrival of wave energy is observed at the geophone position. After picking is completed, a 2D P-wave velocity (Vp) model is generated that best fits the first arrival picks. Result: The interpretive geophysical results for the SRT lines were generated from the data results. The horizontal (distance) and vertical (elevation) dimensions are shown in feet. For the color scale, 'cool' colors (e.g., blue) represent lower velocity values and 'warm' colors (e.g., red) represent higher velocity values, where higher velocity values are associated with relatively harder material (bedrock). Olson's investigation was used by the customer in the design of a tunnel to realign the water flow.